The full range of Power Team hydraulic fittings, rated for use in systems with a maximum pressure of 700 bar (unless stated otherwise). These fittings are tailored for SPX Flow / Power Team products. Accept only the highest quality components in your hydraulic system. Shop the range today. If you’re looking for new or replacement hydraulic fittings, such as hydraulic hose fittings or stainless steel fittings and even new quick release fittings, look no further than SGS. Our varied selection is sure to have what you need for a great value price. Browse our selections of Power Team hydraulic fittings today and place your orders. We’re pleased to say we have a full range of Power Team hydraulic fittings available here at SGS. Our stainless steel pipe fittings and hydraulic connectors are also rated for use in systems with a maximum pressure of 700 bar (unless stated otherwise). These fittings are tailored for SPX Flow / Power Team products. Whatever your preferences though, count on only receiving the best in quality fittings and hydraulic connectors. The importance of having the right hydraulic fittings, whether they’re hydraulic hose fittings or just replacement stainless steel fittings, simply cannot be understated. As such if you need any assistance with your purchases, don’t hesitate to get in touch with our team. Our experts are on hand to answer any queries you may have to ensure you always get the correct option, from quick release fittings to hydraulic connectors and much more. Alternatively, simply take a look at our selection and purchase your next hydraulic fittings from SGS Engineering. 9190 Hyd. tubing. 3/8" O.D. x .065" wall, 15,3 m. (10 pieces 1,53 m long.) Wt. 5,5 kg. 9670 Tee adapter. For installing gauge between pump and hose coupling. Has 1/4" and 3/8" NPTF female and 3/8" NPTF male ports. Wt. 0,2 kg. 9671 Double tee adapter. Permits use of more than one cylinder in series with one pump. Three 3/8" NPTF female ports. Wt. 0,5 kg. 9672 Service tee. Two 3/8" NPTF female internal, one 3/8" NPTF male external. Wt. 0.3 kg. 9673* Swivel connector. 3/8" NPSM male, 1/4" NPSM female. Wt. 0,1 kg. 9674 Male connector. 43 mm long, 1/4" x 3/8" NPTF. Wt. 0,1 kg. 9675* Swivel connector. 3/8" NPTF male, 3/8" NPSM female. Wt. 0,1 kg. 9676* Swivel connector. 1/4" NPTF male, 3/8" NPSM female. Wt. 0,1 kg. 9677* 45° swivel connector. 3/8" NPTF male, 3/8" NPSM female. Wt. 0,1 kg. 9678 45° fitting. Used when mounting gauge at an angle on connection such as 9670. 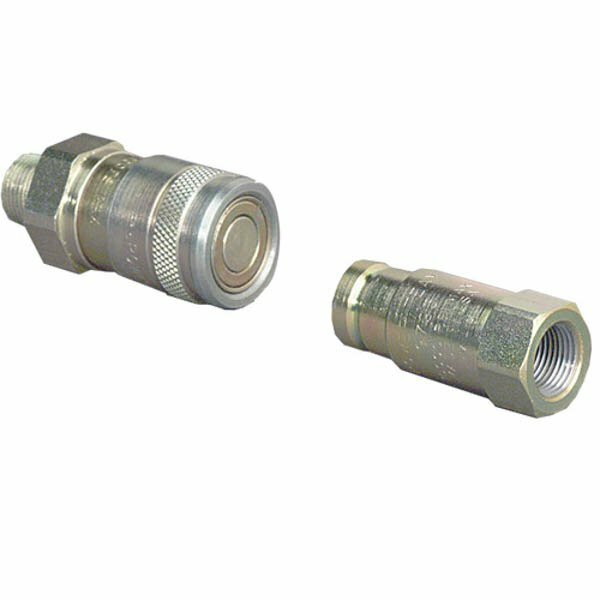 Male and female 1/4" NPTF ends. Wt. 0,1 kg. 9679 Connector. 1/4" NPTF female and 3/8" NPTF male. Wt. 0.1 kg. 9680 Coupling. Both ends 3/8" NPTF female. Wt. 0.1 kg. 9681 Street elbow. Male and female 3/8" NPTF ends. Wt. 0,1 kg. 9682 Male connector. 43 mm long, 3/8" NPTF male ends. Wt. 0,1 kg. 9683 Male connector. 57 mm long, 3/8" NPTF male ends. Wt. 0,1 kg. 9685 Coupling. 1/4" NPTF female and 3/8" NPTF female. Wt. 0.1 kg. 9686 90° elbow. 3/8" NPTF female ends. Wt. 0.2 kg. 9687 Pipe plug. Heat-treated, 3/8" NPTF. Wt. 0.1 kg. 9688 Pipe plug. Heat-treated, 1/4" NPTF. Wt. 0.1 kg. 9689 Connector. 1/4" NPTF male and 3/8" NPTF female. Wt. 0.1 kg. 9690 Male connector. 43 mm long, 1/4" NPTF male ends. Wt. 0.1 kg. 9692 Straight connector. 3/8" tube x 3/8" male NPTF. Wt. 0.1 kg. 9693 90° elbow. 3/8" tube x 3/8" male NPTF. Wt. 0.1 kg. 9694 45° elbow. 3/8" tube x 1/4" male NPTF. Wt. 0.1kg. 9695 Tee. 3/8" tube. Wt. 0.1 kg. 9696 Male run tee. 3/8" tube x 1/4" male NPTF. Wt. 0.1 kg. 9697 Male branch tee. 3/8" tube x 1/4" male NPTF. Wt. 0.1 kg. 9698 Cross. 3/8" tube. Wt. 0.2 kg. 9699 45° gauge fitting. 3/8" NPTF male and female, and 1/4" NPTF female at 45°. Wt. 0.3 kg. 9705 Fitting, swivel. 3/8" NPTF male to 3/8" NPTF female. 90° fitting with internal 370 micron screen. May be rotated 360° about male thread axis.